In order to prevent submissions from being considered previously published, Open Mic is password-protected (more details here). You will only have to enter the password once to gain access to all submissions. 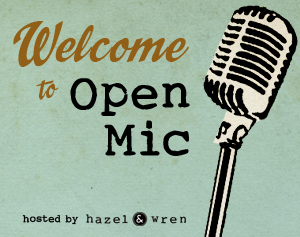 If you do not have the password yet, please email openmic@hazelandwren.com, and the password will be sent to you immediately. No personal information or payment is required to receive the password. Copyright 2019 All Open Mic Submissions copyright of the authors. All other content copyright Hazel & Wren.